Today is kettlebell day! In preparation for the CrossFit Kettlebell Trainer Course coming to CrossFit Amundson on September 8 & 9, 2012, each Friday we are learning and practicing new kettlebell skills. Today we will review our one handed swing series. Then we’ll start to have some fun and learn the Hand-2-Hand series, which includes catching and releasing the kettlebell with one hand! And of course, be prepared for the unknown and unknowable workout. 1) Friday, July 20, 8:45 AM, breakfast at Cliff Cafe. Meet at Cliff’s or the gym. 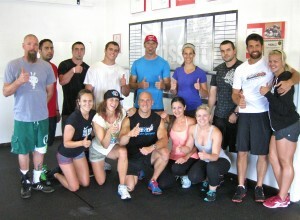 2) Saturday, July 21, 10:00 AM – 11:00 AM Open Gym and Team WOD. 11:00 AM to 12:00 PM Nutrition Seminar.